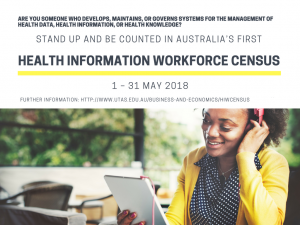 HISA members and the broader digital health community are invited to take part in the first Australian Health Information Workforce census which opens on 1 May. The Census is a collaborative effort between the University of Tasmania, University of Melbourne, HISA, the Australian Digital Health Agency, Australian Library and Information Association Health Libraries Australia, Australasian College of Health Informatics, Health Information Management Association of Australia, and the Victorian Government Department of Health and Human Services. The census is voluntary and open to everyone who identifies as part of the health information workforce. The aim is to quantify and qualify the Australian Health information Workforce (HIW), specifically to delineate and count the workforce, consider the future configuration of workforce, identify health information workforce shortfalls, and identify current health information training and career pathways. The census will remain open throughout May 2018. Read more about the census and prepare for the opening day of 1 May HERE.